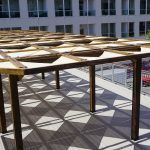 PENUMBRA is the name given to an 850 SF structure designed and constructed by twelve Iowa State University students on the roof of the Des Moines Social Club (DMSC) Kum & Go Theater. 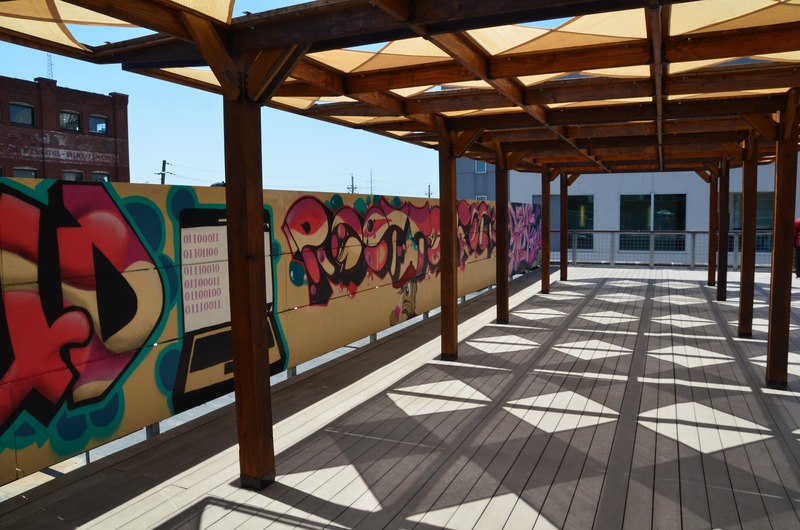 The project leveraged architectural design as a tool for community engagement and succeeded in expanding the usability of the rooftop – thus allowing the DMSC to enhance their potential for outdoor community activities. The DMSC is a non-profit organization which aims “to use the arts as a catalyst to create unprecedented community engagement” in Des Moines. The organization welcomes 25,000 visitors each month with a yearly revenue of $1.5 million for events ranging from gallery openings to rooftop theater performances and concerts. In 2013, the organization worked with Slingshot Architecture to renovate the historic art deco Des Moines Firehouse Number One, creating a campus of 30,000 square feet for performances and events to take place within the urban fabric of downtown Des Moines. 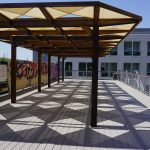 Among such spaces is the 1800 SF Kum & Go Theater Rooftop, which provided desirable outdoor space, but faced the issue of not providing shade during its time of most frequent use: April-October. 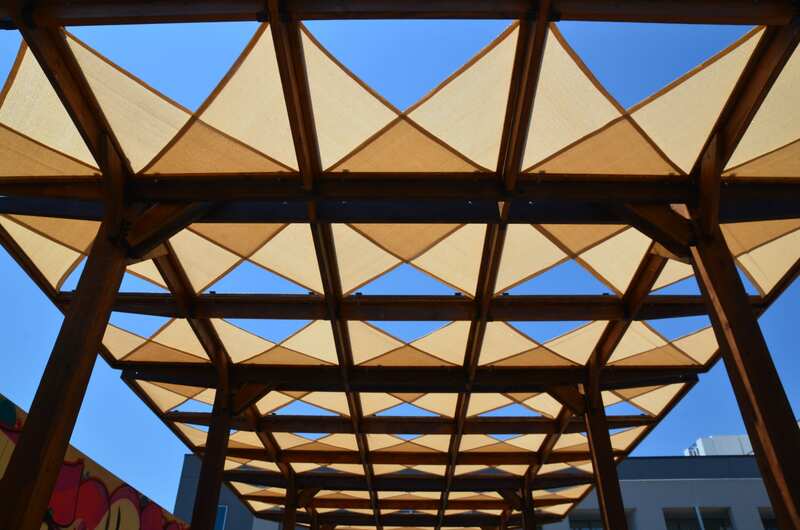 The DMSC received a grant to provide a shade structure in collaboration with the ISU Computation & Construction Lab. Led by Assistant Professor Shelby Doyle, AIA, twelve ISU Department of Architecture students worked to design and build a structure that would allow the organization to further their mission. The students had only eight weeks to take their design from an idea to construction. This process encountered all of the constraints and conversations necessary to bring any architectural project to fruition. The class met with Des Moines City Zoning & Planning commission to seek approval for a non-permitted ‘pergola’ designation. Then, as the site is listed on the National Registry of Historic Places, the project was reviewed, adapted, and approved by SHPO (State Historic Preservation Office). Finally, local firm Raker Rhodes provided structural engineering calculations to help ensure structural integrity. Each step required quick, iterative, reworking of the design. While the design went through nearly fifty iterations, the final design and build conveys the intent of the design team: to use the sun as a design tool, to create an open and flexible design, and to reflect the goals of the DMSC. The project relied upon an underlying grid of 42” drawn from the railing of the existing deck. This allowed the project to be easily constructed and maintained and allowed for flexibility. 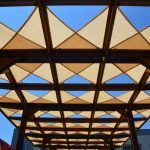 Constructed of wood and exterior grade shade cloth the project layers together solidity and softness of the fabric to create a layered shadow or PENUMBRA. After assembling all of the necessary parts in Ames, the pieces were relocated to Des Moines for installation. 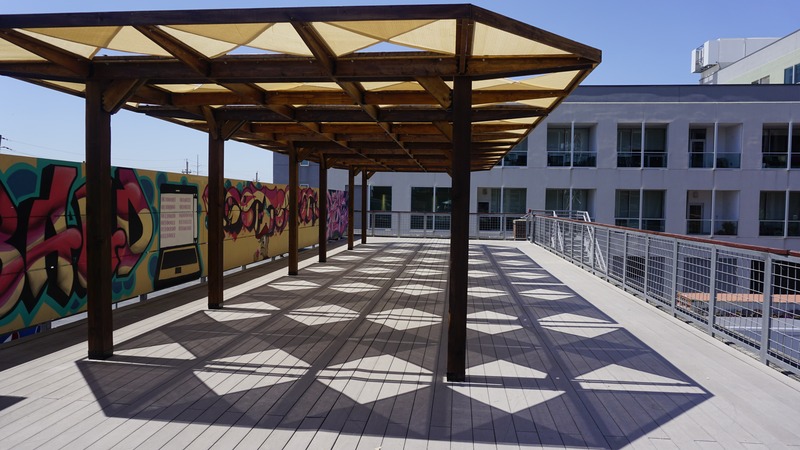 The project shades over half of the 1800 square feet of the rooftop and provides the DMSC with a space that can be comfortably occupied and utilized to its fullest potential. 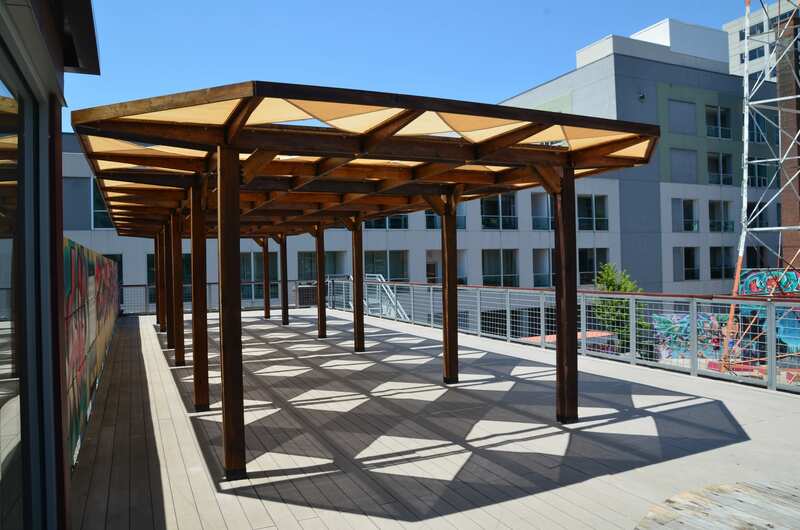 PENUMBRA simultaneously enriches and enlivens the space of the rooftop by providing the organization the opportunity to expand their client base and offer more enjoyable events – during the spring, fall, and summer months, as the panels are easily designed and constructed to be removed and stored in the winter. 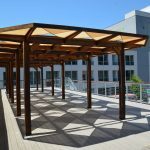 By becoming a part of the urban fabric of downtown Des Moines, PENUMBRA lends itself as an adaptable and functional structure for the organization and community as a whole. As the organization continues to grow and impact Des Moines, PENUMBRA will offer an enjoyable and welcoming space which catalyzes and magnifies the impact of the DMSC’s mission of providing usable space for the arts to bring together the community of Des Moines. After assembling all of the necessary parts in Ames, the pieces were relocated to Des Moines for installation. 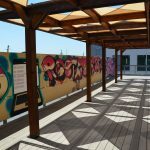 The project shades over half of the 1800 square feet of the rooftop and provides the DMSC with a space that can be comfortably occupied and utilized to its fullest potential. 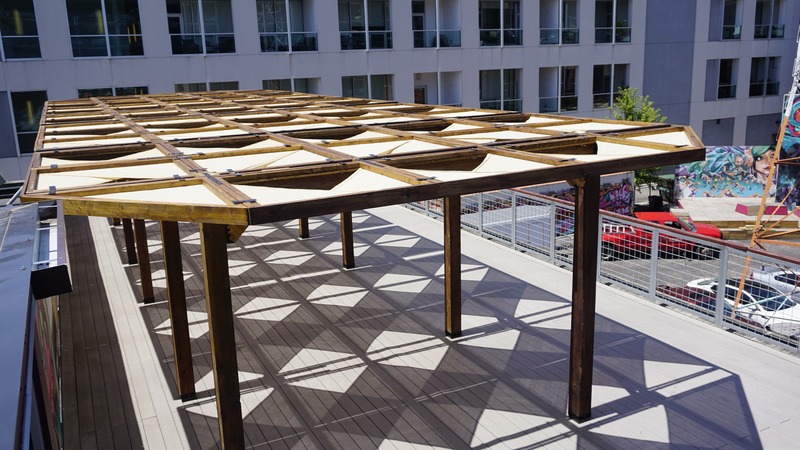 PENUMBRA simultaneously enriches and enlivens the space of the rooftop by providing the organization the opportunity to expand their client base and offer more enjoyable events – during the spring, fall, and summer months, as the panels are easily designed and constructed to be removed and stored in the winter. By becoming a part of the urban fabric of downtown Des Moines, PENUMBRA lends itself as an adaptable and functional structure for the organization and community as a whole. As the organization continues to grow and impact Des Moines, PENUMBRA will offer an enjoyable and welcoming space which catalyzes and magnifies the impact of the DMSC’s mission of providing usable space for the arts to bring together the community of Des Moines.